Through stories that are at once empathetic and unexpected, these women and girls defiantly push the boundaries between selfishness and self-possession. 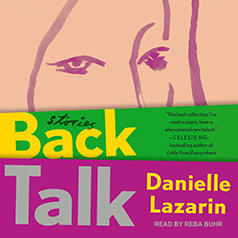 With a fresh voice and bold honesty, Back Talk examines how narrowly our culture allows women to express their desires. In "Floor Plans," a woman at the end of her marriage tests her power when she inadvertently befriends the neighbor trying to buy her apartment. In "Appetite," a sixteen-year old grieving her mother’s death experiences first love and questions how much more heartbreak she and her family can endure. In "Dinosaurs," a recent widower and a young babysitter help each other navigate how much they have to give—and how much they can take—from the people around them.